Today, I spent most of the day in Athens at a conference. After the conference was over, I decided to take a different route home.., US 129 from Athens to I-85 in Jefferson (Jackson County). 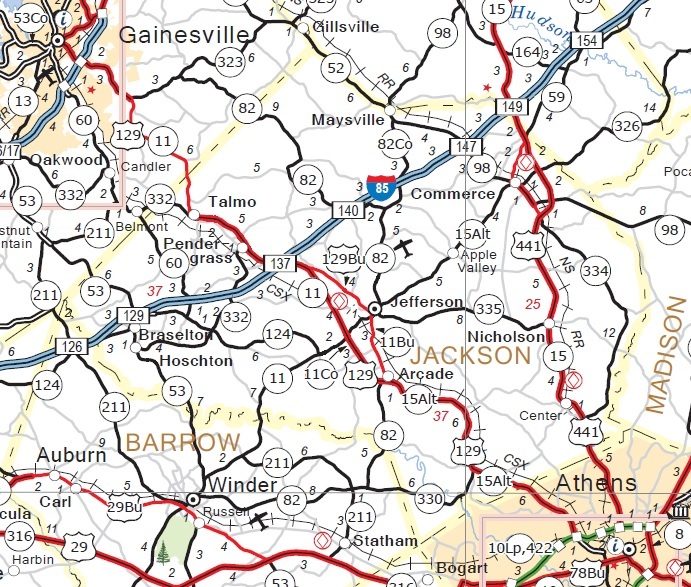 During the last decade, Georgia DOT (GDOT) widened most of US 129 between Athens and Gainesville, making it a 4-lane divided highway and bypassing the cites of Arcade, Jefferson (the Jackson County seat), and Pendergrass. From the Athens Perimeter (GA 10 Loop/422) to Jefferson, US 129 runs concurrent with GA 15 Alternate. 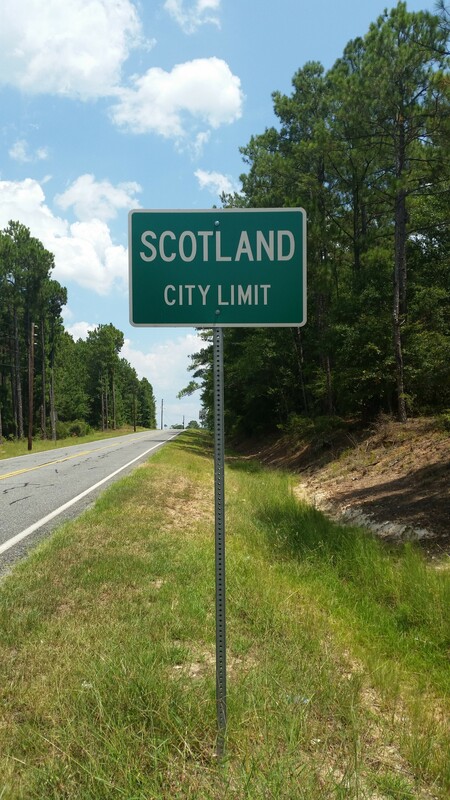 Once the by-pass (designated as the “Damon Gause Bypass”) was completed around 2005, the bypass’s southernmost 3 mile (5 km) segment was co-signed with US 129 as GA 11 Connector. 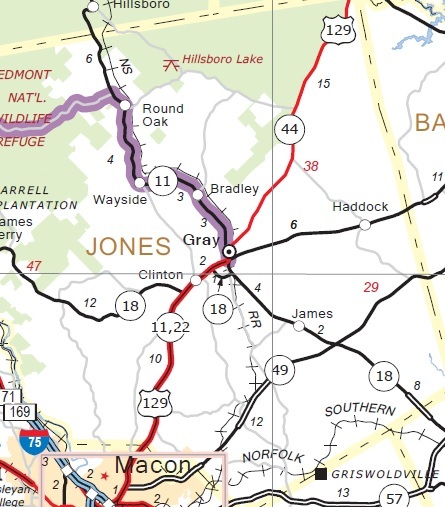 From Jefferson southward, US 129 and GA 11 go their separate ways and later reunite just north of Macon in Gray (Jones County). Through the downtown areas of Arcade and Jefferson, the old US 129 alignment was renamed US 129 Business… or maybe Business US 129 Business? The above photos were taken in Arcade, Georgia, a town once considered a “speedtrap”. According to a 2011 article in the Athens Banner-Herald, the Georgia State Patrol did investigate this allegation, a Federal lawsuit was filed, and in 2009, the Georgia Department of Audits found that $192,000 of Arcade’s total revenue of $675,000 came from traffic ticket fines. I’m not sure what happened with the Federal lawsuit, but the Georgia State Patrol found no wrongdoing on the part of Arcade’s police department. Nonetheless, I made sure that I drove the speed limit of 55 MPH (90 km/h). Anyway, I just wanted to share my “road redundancy” find with y’all. It’s all part of being a roadgeek with Internet access and a blog. One last thing… as I was walking back to my car, an Arcade cop did stop very briefly, asked if I was alright and if was taking pictures. I just smiled, answered, “Yep”, and he just moved along… and so did I. Speaking of moving along, I’m going to do so for now. Thanks for reading my blog and please “like” the GRG Facebook page and/or “follow” GRG on Twitter. This entry was posted in Uncategorized on March 7, 2015 by georgiaroadgeek. A week ago Friday, Mary and I took an extended weekend off and decided to visit Amelia Island, Florida. Normally, I’d’ve taken the Interstates (I-75, I-16, and I-95) down there and back, but for the trip to Florida, I decided to take one of Georgia’s roads less traveled… The Golden Isles Parkway. 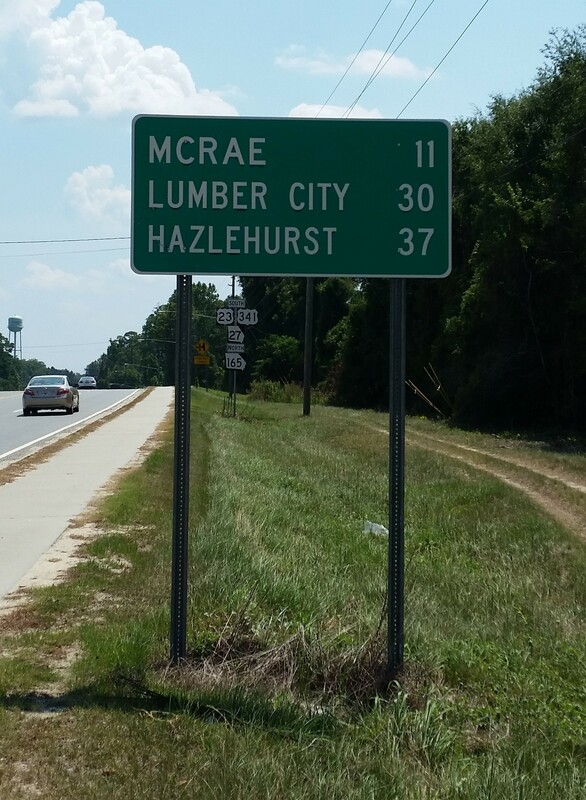 This highway, which US 341 follows for most of its journey from I-75 (Exit 135) in Perry (Houston County) to I-95 (Exit 36) in Brunswick (Glynn County), is a 168-mile (269 km) Governor’s Road Improvement Program (GRIP) corridor that is 4-lanes, mostly divided. 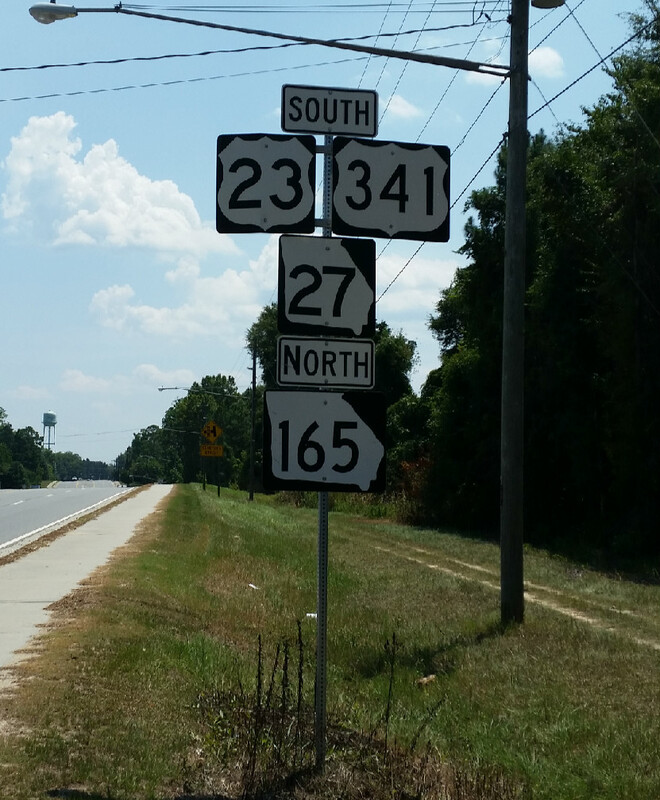 US 341 uses the majority of the corridor, but the westernmost section near Perry is designated GA 224. Between cities on the divided highway portions, the speed limits are as high as 65 MPH (105 km/h). There are by-passes around the downtown areas of Hawkinsville (Pulaski County) and Eastman (Dodge County), but please be aware that speed limits can drop as low as 35 MPH (55 km/h) where the Parkway goes through downtown areas. Even on the by-passes, the speed limit is no higher than 55 MPH (90 km/h). On the southbound side of the Hawkinsville by-pass (actually more of a “truck route” that takes you around downtown), there is a paved pull-off area signed as a weigh station. When we passed by it, no one was there, but if I were a trucker, I’d keep it in the back of my mind when having to drive my “big-rig” through there. 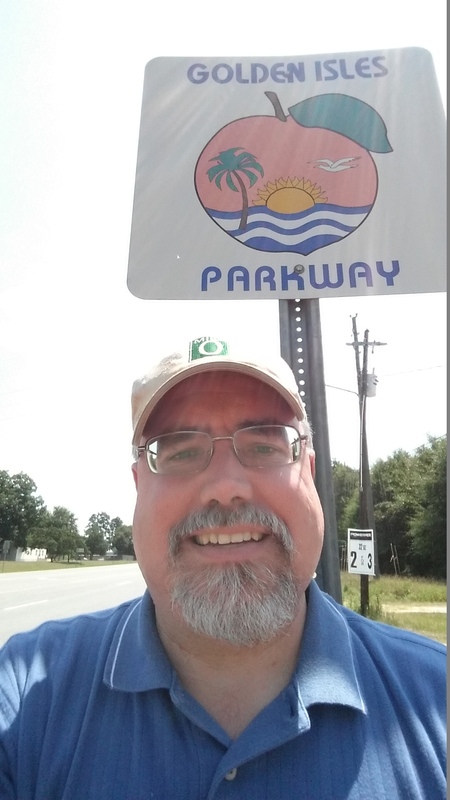 In the town of Chauncey (Dodge County), I encountered a “wrong-way” multiplex of highways where you can go both south and north, depending on the highway route. In Georgia, US Highways 23 and 441 meet again approximately 200 miles (320 km) north of McRae in Cornelia, Georgia (Habersham County), where they will share pavement from there until they go their separate ways just north of Dillsboro, North Carolina. As a roadgeek, I can now say that I’ve been to both 23/441 meeting places. US Highways 280 and 441 are also GRIP corridors. US 280 is also known as “Power Alley”. In Downtown McRae, at the northeast corner where the 5 US Highways meet, there are two (2) American Icons. 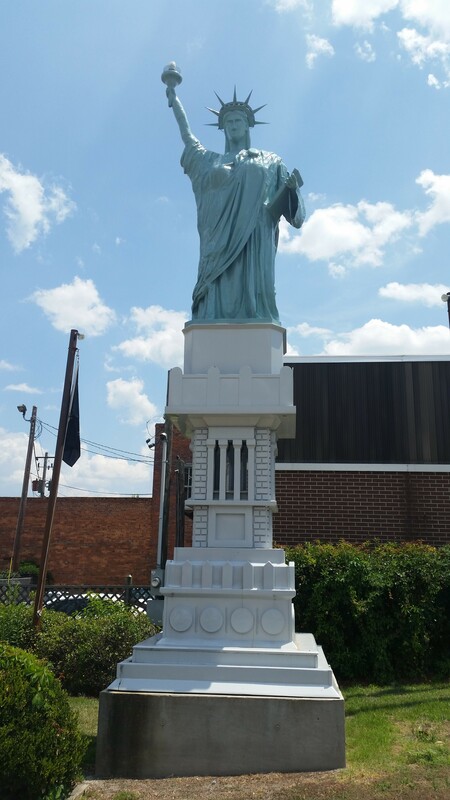 This replica was built by the McRae Lions Club in 1986 to honor the real Statue’s 100th Anniversary. 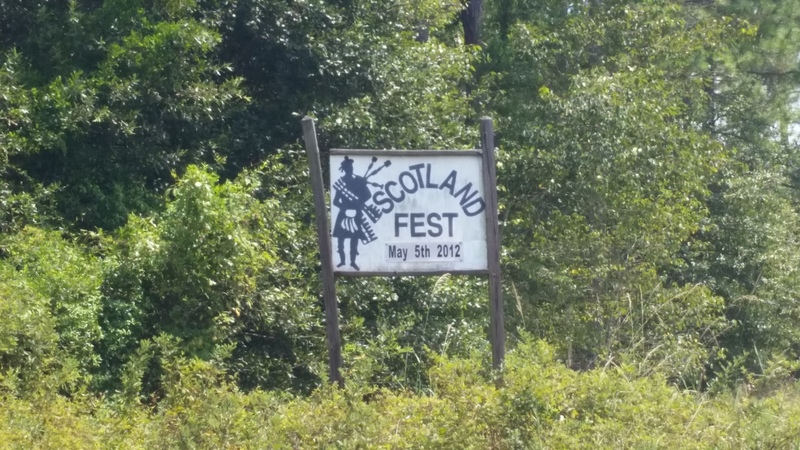 Just across the railroad tracks and a river bridge on GA 149 in dear ol’ Scotland, there was Wheeler County, which I quickly “clinched” by “froggieing” it (drove into, turned around, and headed back). Further down the road, I “clinched” Jeff Davis and Appling Counties. From Waycross, I continued down US 1/23 to Folkston (Charlton County), where I turned east on Georgia Highway 40 to get to I-95. 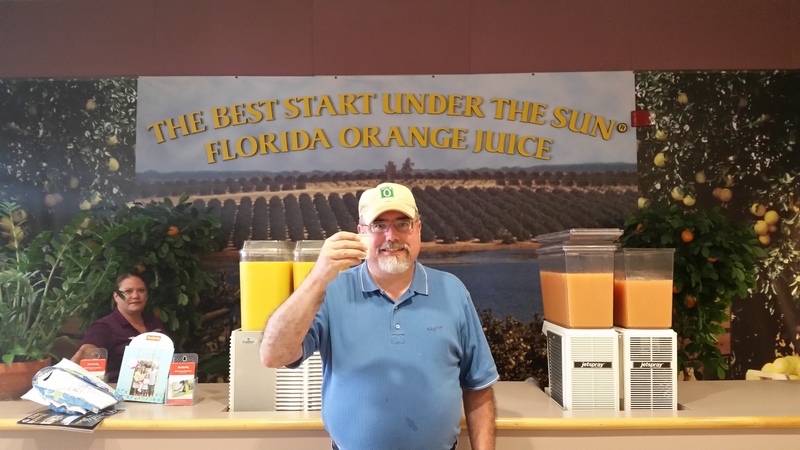 As soon as we reached our hotel in Fernandina Beach on Amelia Island, I was not only happy that the journey was over, but also that both my wife and I were happy, and from that point, we had a great 3-day visit in the area. Monday, on the way back home to Atlanta, I stayed on the Interstates. 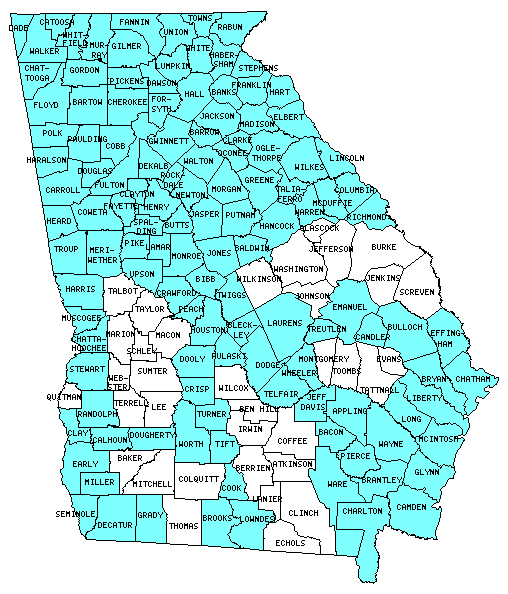 For the trip down, I “clinched” Pulaski, Dodge, Telfair, Wheeler, Jeff Davis, Appling, and Bacon Counties, bringing my Georgia “clinched” total to 124 out of 159 counties. That’s it for now. I dedicate this blog to my lovely (and understanding) wife Mary for letting me take “the road less traveled” and thank you for visiting. Please “like” us on Facebook and “follow” us on Twitter and Instagram. This entry was posted in Uncategorized on August 23, 2014 by georgiaroadgeek. 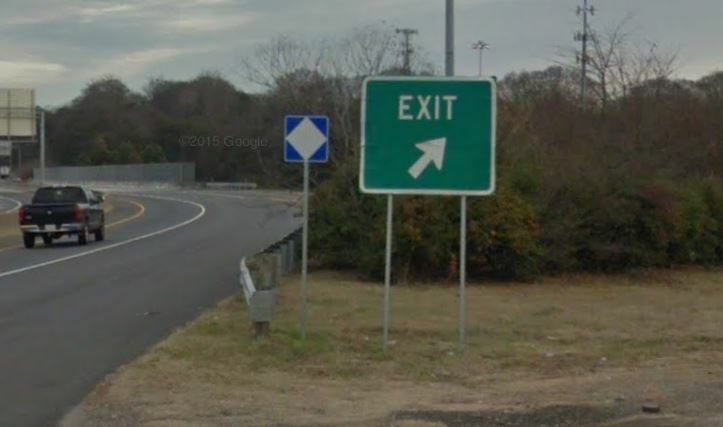 Recently, I was looking at Thomasville, Georgia (population 18,413 as of 2010), on a Google Map and the roadgeek in me had an idea for adding a brand new southern by-pass of this southwest Georgia city. 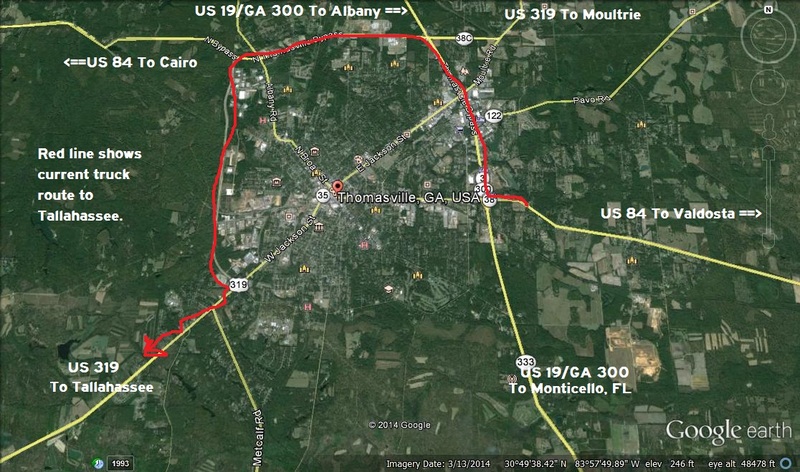 As you can see from the above image, traffic (especially truck traffic) that would be travelling between Tallahassee and Valdosta via US 319 and US 84 would have to go all the way around the west and north sides of Thomasville. 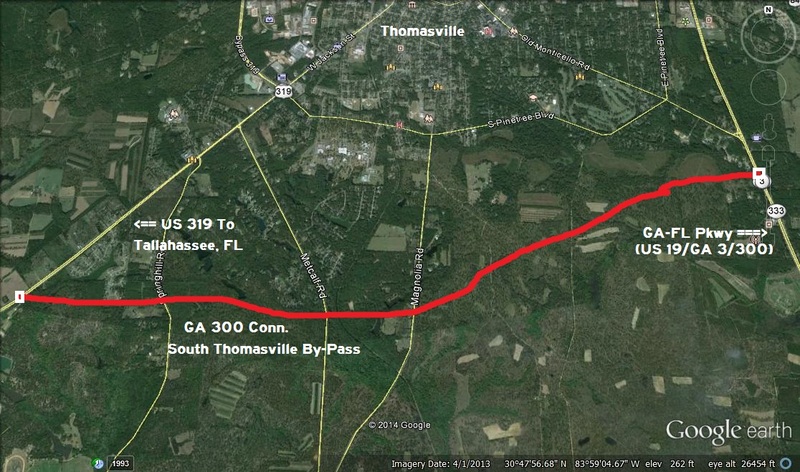 To facilitate the smooth flow of traffic, the South Thomasville By-Pass would be a four-lane limited-access divided highway. 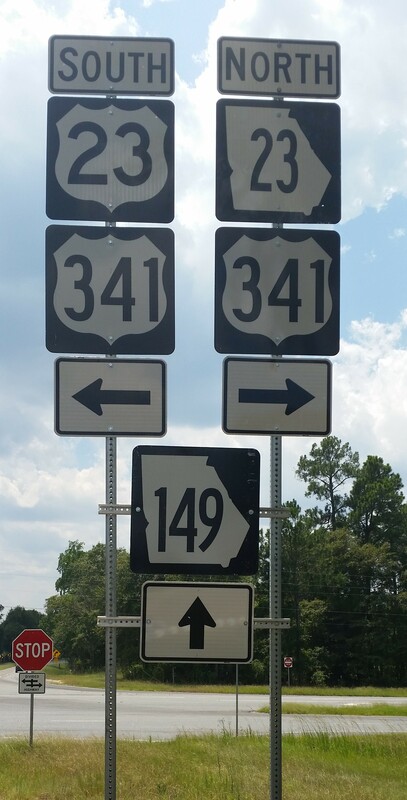 The only access points would be at the western (US 319/GA 35) and eastern (US 19/GA 3/300) ends. What are your thoughts about such a road? Do you think such a road would be useful? Why (or why not)? 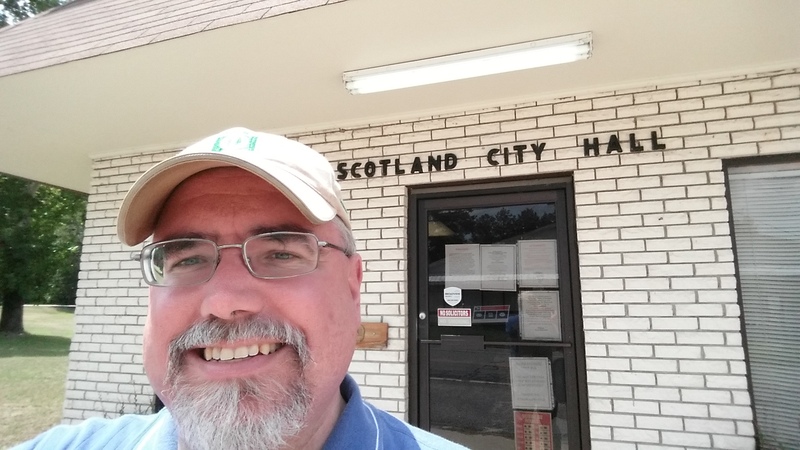 If you are a reader from the Thomasville area, I’d really love to know what you think. Please feel free to share your thoughts by either commenting on this blog or on our Facebook page. Well, folks, that’s all for now. We’re currently celebrating the 4th of July by watching “A Capital Fourth” on our local Georgia Public Television station. Thanks for reading and may you and yours have a very happy and safe 4th of July weekend. This entry was posted in Uncategorized on July 4, 2014 by georgiaroadgeek. 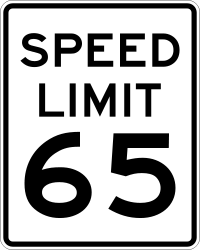 According to the GDOT VSL “fact sheet”, the non-peak maximum speed limit will be 65 MPH (105 km/h). To regulate traffic flow, speeds can be adjusted in 10 MPH increments, varying the speed limit to as low as 35 MPH (55 km/h) during peak rush hour traffic. As a frequent user of the “Top End” for my daily commute, I’m glad to see that the speed limit on the “Top End” will be as high as 65 MPH. However, as for how the VSL will help traffic flow during rush hour, I’m taking a “wait-and-see” attitude on this. Nonetheless, I’m looking forward to seeing the new VSL on I-285. Interstate 16 from Twiggs County (just east of Macon) to I-95 in Chatham County. Interstate 20 from just east of Covington to the Augusta-Richmond County line. Interstate 185 from I-85 in Troup County to the Muscogee County line. What are your thoughts on Georgia’s speed limits and where do you think they are either too low or too high? Please feel free to share your thoughts either by replying to this blog on our our Facebook or Twitter pages. That’s it for now. Have a happy and safe 4th of July weekend, thanks for reading, and please come back often. “Variable Speed Limits (VSL)“, Georgia Department of Transportation website. This entry was posted in Uncategorized on July 3, 2014 by georgiaroadgeek. ExploreGeorgia.org is the state’s official tourism website, operated by the Georgia Department of Economic Development (formerly known as the Georgia Department of Industry, Trade, and Tourism). That’s it for now. Thanks again to Russell for his input, and to y’all for reading. This entry was posted in Uncategorized on December 28, 2013 by georgiaroadgeek. For the longest time, I’ve thought that Georgia is long overdue for a “welcome”sign change. 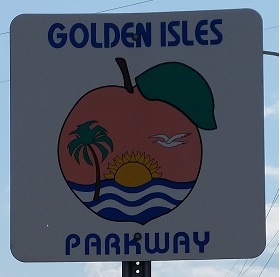 The above sign incorporates Georgia’s official logo, eliminates the previous wordiness of the current welcome sign, and gives a nod to Georgia’s history and desire for businesses to locate to our state. One thing I would definitely eliminate would be a sign saying who our governor is. 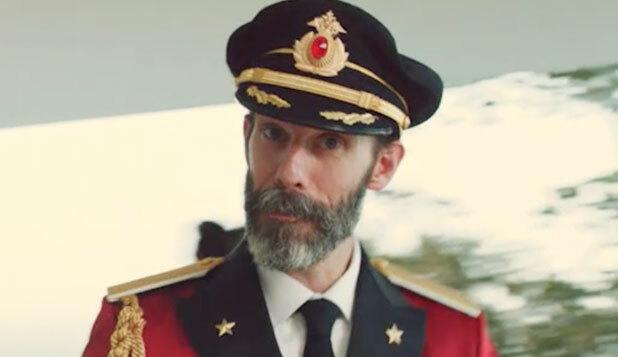 IMHO, very few people really give a care about who a state’s governor is. 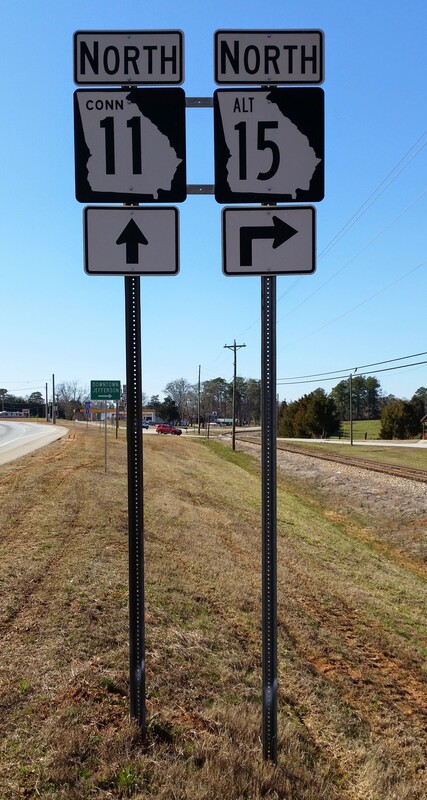 Everytime we change governors, it costs us, Georgia’s taxpayers, money to go and change all those signs. If you’re curious about who the state’s current governor is, then visit the state’s official government or tourism website. What do you think? Please feel free to post your thoughts. That’s it for now. Thanks for reading and please come back soon. Hey, y’all! Hope you’re having a wonderful holiday season! Last night, Mary and I got back from our annual Christmas Florida roadtrip to see her family in Central Florida. Last Friday, as we crossed into Florida on I-75, I noticed that something was missing… their ubiquitous motorist aid callboxes. Above photo taken at the Florida Welcome Center on I-75 by Mary Williams. Fortunately, I didn’t need a callbox to summon help. Last night, I posted a question to the AARoads Facebook page to see if anyone knew when they disappeared. 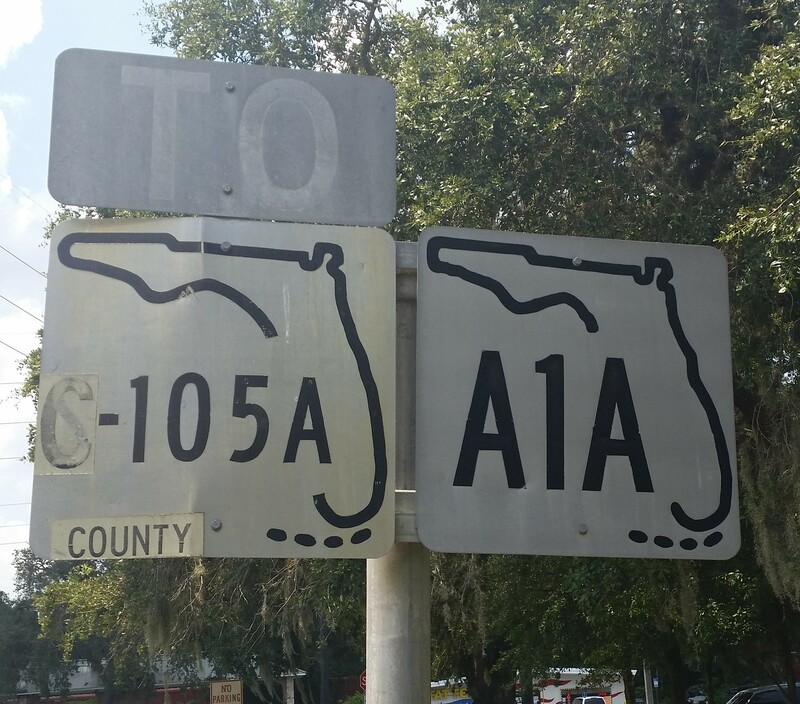 Thanks to AARoads’ own Alex Nitzman of Florida, I learned that the Florida DOT (FDOT) has been removing all Interstate callboxes and that the removals should be completed by the end of January, 2014. Here is the article from Gainesville, Florida’s, WCJB-TV (ABC 30) that Alex shared. 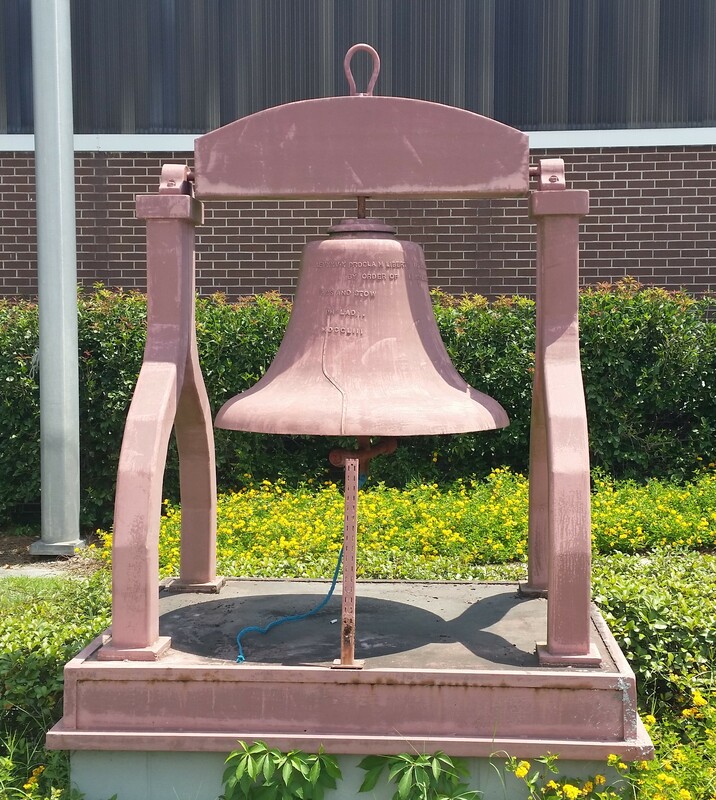 For FDOT’s statewide callbox removal plan, please click here. With the widespread use of cellphones over the last 15 years, it’s not surprising that the 40-year-old callboxes are being removed. It’s been over 5 years since I’ve traveled down I-185, but last I checked, the boxes were still there. However, it’s probably just a matter of time before GDOT removes them, assuming that they are still there. I’ve never had to use a callbox, but as a motorist, it’s been reassuring to see them along rural stretches of Interstate highway. With their impending demise, it’s definitely wise to have a cellphone (and a car charger) with you during your travels. Here in Georgia, you can dial 511 from your cellphone anywhere in Georgia to receive motorist aid or check traffic conditions. Finally, we here at GRG HQ in Atlanta wish you and yours a happy and safe holiday season as well as safe travels. Please “like” us on Facebook, follow our “tweets” on Twitter, as well as subscribing to our blogsite, and we thank you for your continued support. RIP motorist aid callboxes and thank you for being there for the traveling public. P.S. Please share the love with AARoads and “like” them as well. I highly recommend them. This entry was posted in Uncategorized on December 27, 2013 by georgiaroadgeek.